Educators have been tapping into the wildly popular online game Minecraft for its potential as a learning tool for a while now -- to teach physics, math, and computer science. But until recently, the game was mostly the territory of computer science teachers, and even they were forced to use the commercial version of the online game. Teachers like to use Minecraft because it's a “sandbox” game -- it provides players nearly limitless freedom to build within it. As a player’s skill develops, the game’s complexity increases ad infinitum. In multi-player levels, players collaborate on building complex structures, use programming features to build contraptions, games, or compose music. Meanwhile, beginning players use their problem solving skills to scavenge for materials. They learn to mine stone for building, and coal for making fire. "Many educational games start with the question, ‘What should we teach with the game?’ and they forget the most important part, that it should be a great game too." Koivisto and Levin decided to pursue a classroom application after observing students solve complicated problems with their collaboration in the game. When Koivisto tested Minecraft at a Finnish school, one-third of the 20 teachers in the study later chose to incorporate the game into their teaching. Koivisto and Levin, who uses the game with his second-grade students, are part of the growing movement of teachers who see video games as more than entertainment and educational games as more than a means to an end. They flip the usual query of educational games, “What should we teach?” for a different question altogether: “Is it fun?" “Many educational games start with the question ‘What should we teach with the game?’ and they forget the most important part, that it should be a great game too,” says Koivisto, who lives in Finland. They also steer clear of specific educational agenda for the game. Instead, they encourage teachers to first watch how their students behave in the Minecraft world, then proceed with lesson plans that incorporate the game and the student's reaction to it. 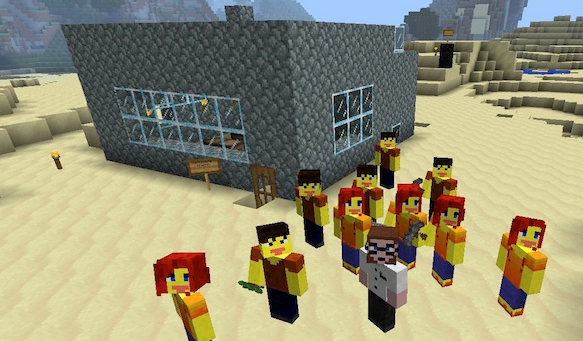 New York public school science teacher Matt Coia says the MinecraftEdu version provides a deeper level of administrative control than the commercial version, and dovetails neatly with his general teaching goals. “As a teacher, I can select how much freedom the students are allowed to have within the game and also the level at which the game reacts with them,” he says. Coia also likes that MinecraftEdu allows him to build customized maps to elaborate on a specific concept. Currently, 300 schools around the world, half in the U.S., have purchased game licenses. As with most games, the pricing structure is complicated. For schools and educators, the price is $18 per license (per computer). Schools can buy bundles of licenses that make the cost of each about half that price.